Brian Nielsen, 48, and Hall of Fame promoter Mogens Palle, 81, are back in business and both received promoter's licenses from the Danish Federation yesterday. The two will work on a concept billed as Danish Fight Night.com. However, no fighter nor shows has been announced and while the talk is that there´s a lot of talent in Denmark there are no obvious names. 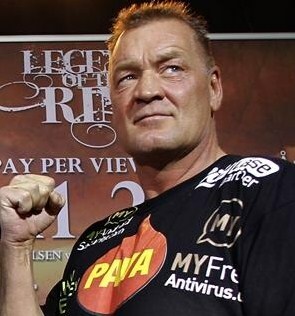 Nielsen (64-3) retired in 2002 but returned in 2011 for a fight against Evander Holyfield while Palle with over 50 years in the business has been semi-retired since Mikkel Kessler left around 2008. Nielsen is still regarded as the most popular Danish athlete ever. It’s likely that Sauerland Promotion, who has dominated the Scandinavian scene for last few years, will stage more shows in Sweden during 2016 and perhaps also in Norway and less in Denmark and that may open a door for other promoters. Also back in business are Anders and Allan Vester and the two promote a show in Kjellerup October 31 topped by lightweight Osama Hadifi (11-0) and Dina Thorslund (3-0). EBU lightheavyweight champion Igor Mikhalkin (18-1) retained the title Friday night in Clermont Ferrand (France) with a unanimous decision over Hugo Kasperski (26-8-1). After twelve it was scored 117-111, 117-111 and 116-113. Kasperski was off to a good start but had no answer when Mikhalkin upped his workrate and promoter Erol Ceylan felt his man won every round. Undefeated heavyweight prospects Tom Schwarz (14-0, 9) and Ilja Mezencev (10-0, 10) co-headlines SES’ show in Dessau November 14. At stake is an undisclosed Youth title in what is an exciting matchup. In the second mainevent WBO female superfeather champ Ramona Kuehne (23-1) defends her title against an opponent to be announced. Kuehne was announced as opponent for Cecilia Braekhus but apparently the parties never signed any contract. Frez Oquendo have according to the Sparkassen Arena in Kiel (Germany) pulled out of the fight against WBA regular heavyweight champ Ruslan Chagaev due to illness. The fight was set for October 17 at the Sparkassen Arena in Kiel (Germany).